Before homesteader Wilcox Utter staked the first claim in 1853, Ballard was a lushly forested hill covered in streams, gently rising from the saltwater tideflats of Salmon Bay. What if redevelopment could recreate a piece of pre-settlement Ballard with a modern twist? The site would pull double duty as habitat and refuge for both humans and wildlife. So began a landscape architect’s dream journey: design an urban, infill site in a densely populated neighborhood that is 50 percent open space, with the goals of greening the buildings as much as possible, offering a home to wildlife, and creating areas for urban agriculture. It should include rainwater harvesting, green roofs and a green wall to reduce the buildings’ environmental impacts, provide wildlife habitat with a wetland that also serves to clean stormwater runoff. Deep soils allow trees, shrubs and perennials to thrive while nurse logs create lasting habitat on the roof. Undisturbed natural areas, such as a protected forest, respond slowly to changes in the immediate environment. Designing a semi-natural area between two modern buildings presented a few challenges. Originally, we wanted to infiltrate all of the site’s stormwater runoff through the use of rain gardens, which are essentially urban wetlands. But Ballard’s infamous hardpan soils, which prevent water from soaking into the ground, presented a challenge. Eventually, through creative and subtle manipulations of the topography and thoughtful native planting design, we can have dry basements and an urban wetland. The central spine of Greenfire is a hard-working wetland that will create an amazing opportunity for wildlife  functioning as a native ecosystem. At more than 8,000 square feet, a wide range of plants along with a new tree canopy will improve water quality and provide habitat for local birds, pollinating insects and other fauna. This dedication of open space will provide a stepping stone for urban wildlife between other parks and open space. Small animals like butterflies and frogs can only move a limited distance each day, so every patch of habitat helps. 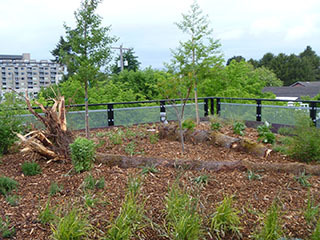 New habitat at Greenfire ranges from native plants in the moist, shady wetland garden to drought-tolerant plants on the dry, sunny roof gardens. This diversity provides both greater habitat value as well as stimulating scenery and refuge for people. Atop the two buildings, generous green roofs have 12 to 30 inches of soil  more than enough to support a wide range of plants including trees, shrubs and large perennials. With greater soil depth comes greater plant diversity. Bold color and long-blooming flowers will bring birds and bees to the roof. Runoff from roofs feed the cistern, which overflows into a cascading water feature, winding through the P-patch gardens. Recent studies at York University in Toronto have found that green roofs planted only with sedum species do a poor job of absorbing water and often they soak up heat rather than reflect it. Taking this into consideration, Greenfire roofs are planted with grasses, perennials, shrubs and trees. Bringing the quality of the habitat up another notch, we installed large woody debris, possibly for the first time in green roof history. These 18-inch-diameter Douglas fir logs act like fallen trees and provide excellent habitat for soil creatures  nematodes, insects and microbes  which, in turn, draw birds. Large woody debris is also used throughout the wetland. As any gardener knows, vegetable gardens can take up a lot of space and water. The ethos of Greenfire prioritizes growing food and a sustainable lifestyle over additional building space. The goal was to maximize the agrarian footprint and employ conservation measures to harvest rainwater for growing plants and vegetables. Nearly 3 feet of rain falls every year in Seattle, so there is plenty to go around. The trick to using rainwater for growing vegetables is finding a cost-effective way to store the water for the summer months. 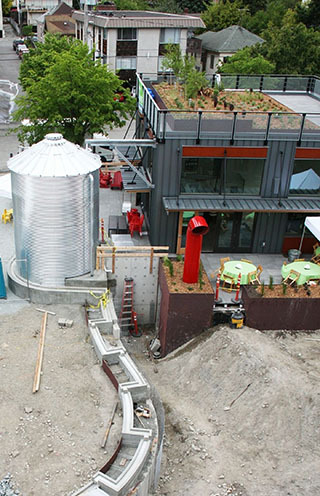 At Greenfire, two large cisterns will store more than 34,000 gallons of runoff from the roofs to water the P-patch gardens, green roofs and streetscape. The cisterns hold enough water to support 18 P-patch plots (each apartment has its own plot) and six additional plots in the office building. At the street scape along the office/retail building, passersby can admire a bounty of vegetables, raspberries and blueberries filling publicly accessible plots. Help yourself. Hops will grow up the trellis on the office building stair and along the wall of the Ballard library. Having publicly accessible garden plots promotes the “social sustainability” philosophy of Greenfire and adds value though inspiration and education. Wildlife harmoniously shares space with the human workers and residents of Greenfire. Open spaces abound across the campus, from large terraces surrounded by Corten steel planters to the green roofs. From the P-patch to the public plaza, there are many opportunities for outdoor living. Our rainwater-fed water feature, a tribute to the streams once covering Ballard, nestles the P-patch next to a large outdoor terrace. Adjacent to a large common room, water overflows from the cistern into the water feature, gliding back and forth around planters until plunging over the gabion basket wall into the wetland, creating a pleasant sound for residents to enjoy while working in their garden plots or relaxing on the terrace. The feature is designed to remind us all that water is a precious resource. During the dry months, the water feature’s small reservoir recirculates the water. The sustainable design of human habitat should go hand in hand with natural habitat, not one at the expense of the other. At Greenfire, large efforts have been made to take this approach to heart. It’s an ecological model that can teach us all how to live a little lighter by sharing some space with nature. Mark S. Garff, ASLA, PLA, led design of the site landscape, urban agriculture and streetscape at the Greenfire Campus.